No broken promised from Unbox Industries! here’s your second chance to own a JUMBO BURGER ELFIE as a special 24 hour pre-order will be made available this weekend. If you miss out this time, you’ll only have yourself to blame. Last month our eyes bulged when TOO Natthapong Rattanachoksirikul’s ‘Elfie’ went XXXL HERE. Did Burger Elfie go XXL? 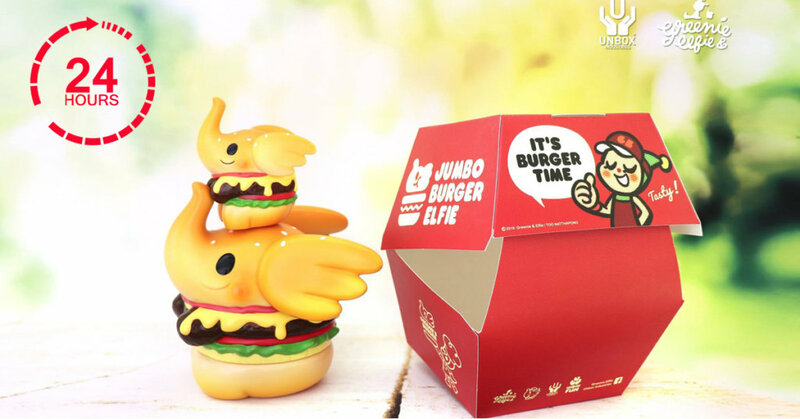 We saw a few teasers back in December 2018 and debuted at ToySoul 2018, but it looks like Jumbo Burger Elfie is ready for a global launch for a second time round! Normal size Burger Elfie was 4inches and this one looks at least a double serving if not more. BUT WAIT, additional fillings can add to your Burger Elfie!!!!! bye bye BIG MAC, HA. TOO Natthapong Rattanachoksirikul’s ‘Elfie’ soft vinyl figure has captured the hearts of collectors throughout the world. We are thrilled to offer the KINGSIZE Burger Elfie this weekend! Keep you eyes peeled for additional fillings that you can add to your Burger Elfie later this year. PLEASE NOTE: MINI BURGER ELFIE IS NOT INCLUDED & SHOWN FOR SCALE. Each basic burger comes with one filling, you can simply pop Elfie apart and stack up the patties/cheese/pineapple!